This turned out to be such a pretty piece. 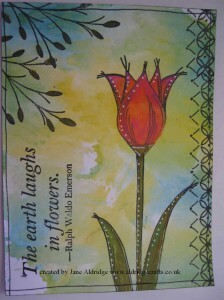 The background has been created by using Distress Paints. I have been demonstrating with them quite a bit recently, which has meant I have a lovely stash of backgrounds ready to work on. This soft background is the second pick up – by that I mean that I have applied the paints to the non-stick mat and then picked up the colour with my card. Then I have spritzed the paint and a new piece of card with water and picked it up again. On this second swoop your colours will be much softer, more watery and you get some pretty results. 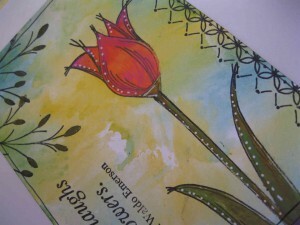 I’ve used the PaperArtsy Tulip stamp set and then painted in the detail with the Distress Paints. The white highlights are from the Sharpie paint pen (due back in stock next week hopefully!). The word is from a different set of PaperArtsy stamps by Sara Neumann. Back soon with my art!